Could the age of retailers versus suppliers be coming to an end? As companies in all parts of the fresh produce business come under greater pressure to provide faster, more flexible and more predictable supply, the importance of strategic partnerships between these different players is also increasing. Click here to download your free copy of Part 2 of the Fruit Logistica Trend Report 2018. Further chapters will be published on the Fruit Logistica website over the coming months. 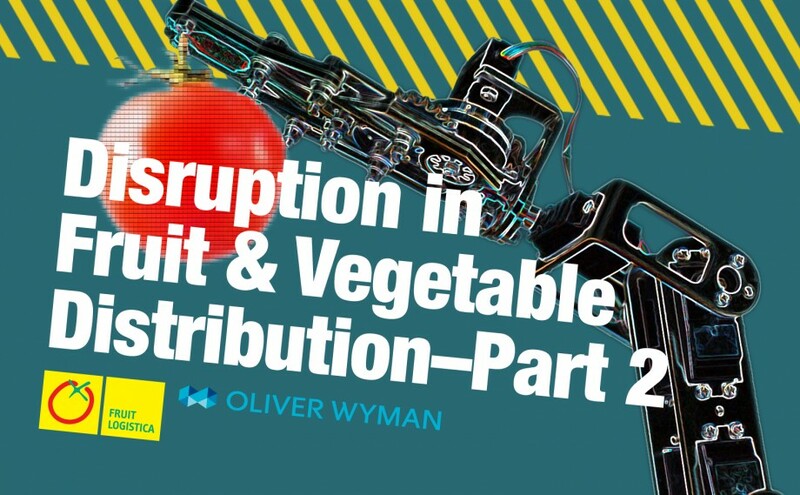 That’s one of the major conclusions drawn in Part 2 of Disruption in Fruit & Vegetable Distribution, a groundbreaking new trend report published by leading industry exhibition Fruit Logistica and written by management consultancy Oliver Wyman. Focusing on the supply chain itself, Part 2 of the report suggests the adversarial approach traditionally taken by some of the major supermarkets when dealing with fruit and vegetable companies will become less common in future. Those that do make progress in such areas can expect to deliver better freshness and to boost consumer satisfaction, guaranteeing year-round supply – whatever the weather – while at the same time making their operations more financially sustainable, the report predicts. However, it suggests, achieving these goals will require investment in better tools to manage key areas like logistics and data, as well as better use of existing resources and improved levels of organisation and coordination. Parts 1 and 2 of the Fruit Logistica Trend Report 2018 are available here. Further chapters will be published on the Fruit Logistica website in the coming months.